Creating opportunities for teens to inspire. ​Our Story: We've ran Leadership Programs for teens since 2011. Every year evolves and pivots into adventures and opportunities for teens all over the world. What started as ONE local leadership program for teens to work with non profits has turned into several leadership programs for teens all over the world. While these programs and their topics and the teens involved change from year to year, our biggest accomplishment (Other than raising hundreds of thousands of dollars for local non profits and thousands of dollars for scholarships for teens all over the world!) has been Inspiring Teens Magazine. Our Inspiring Teens Magazine Story: While talking to my interns one summer (Stephanie Litzenberger and Heather Dobisch) who had been members of our leadership programs for years, I asked them if they would ever want to model for a magazine. They said no, they would rather be in a magazine because they did something amazing or interviewed someone who did something inspiring. Jokingly I asked who they knew who were more amazing than them because these girls are top notch spectacular. They started naming teens who had a national nonprofit that helps raise money for special needs students to get scholarship money (Next Step Programs), had written a theatrical musical with all original music and were in the process of selling it on broadway (Where's Waldo)... the list went on and on and they were all teens who went to their high school! 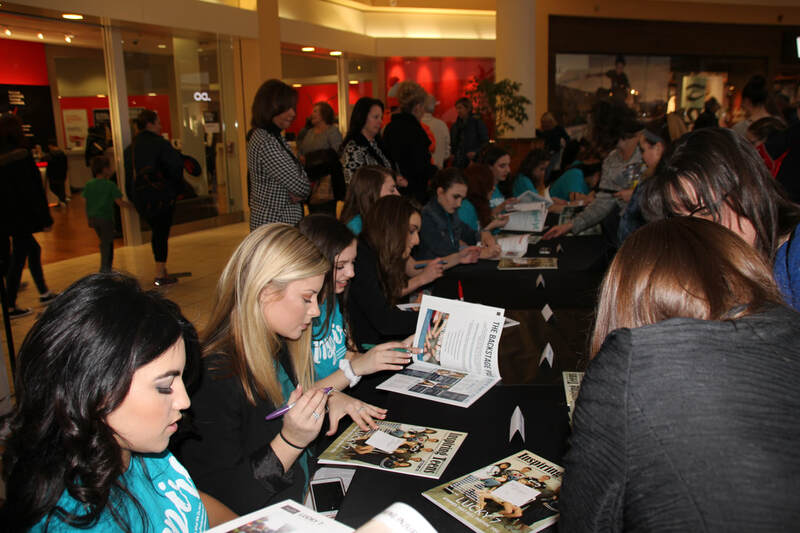 By the end of the conversation they had set up interviews with a handful of teens who were very excited to be noticed in such positive light, and had asked other teens in the leadership program if they were interested in helping them run the magazine. 3 more girls (Hannah Diamond, Amanda Dedieu, and Carly D'Angelo) jumped on board and Inspiring Teens Magazine was borne. From the beginning it was important to the girls to keep the magazine ad free. The publisher we were going with kept us at 62 pages and the girls wanted it 62 solid pages of amazing teen awesomeness. So we've found other ways to keep the magazine in circulation by doing fundraisers like fashion shows, middle school dances, online voting, and hosting workshops and photo shoots at our studio. Fundraising has come second nature to these girls - as we have to fundraise for everything to keep our programs running! We were recently featured on a TV show for our Leadership Programs, Magazine and the work we do with non profits. We do raise money for the magazine, but we also raise A LOT of money for non profits. We've raised more than $100,000 for Children's Hospital of Philadelphia, and thousands for other smaller charities by giving a portion of our proceeds from every fundraiser event we hold for ourselves. In addition, once a month we do a service project that doesn't include fundraising. We've gotten to help train Search and Rescue dogs, garden at the Heritage Conservancy, take pictures at non profit events, cut patterns for shoes for Soul Hope, and so much more! In January we hosted our first international Awards Show for teens featured in 2018 issues. We had people flying in as far away as Germany! As the magazine grows, we have been able to add more benefits like our Inspire Days and Scholarships. We've been able to give away thousands in scholarships this year alone! ​In 2019 we have so many big things planned, it will be hard to keep up with everything - but challenge accepted! Thank you to everyone who has been a part of the success to highlight so many inspiring teens from around the world! This magazine has changed all of our lives, and we hope that it can bring inspiration to everyone it touches.